We at The Rug Shop have some the best textured yellow and golden rugs available. Whether you are looking for a more prominent shaggy yellow rug or contemporary golden you will surely find one which matches your level of perfectionism. Yellow is a colour associated with enlightenment and intellect. The positive vibes which a yellow or a golden rug would bring to a home décor relates to optimism and decisiveness. 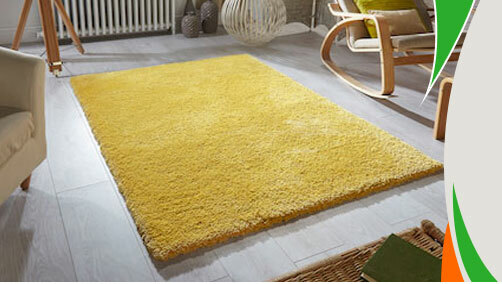 A yellow rug will add a bit of warmth to any living space and helps in creating an intimate feel. Intense shades of yellow and golden would add a bit of excitement and while subdued shades make a perfect setting for a get together or a gathering as they look pleasant. A yellow or golden rug as mentioned above adds a bit of warmth so these are ideal for rooms facing north. These are not too light or dark hence can go along with any type of complimenting room setting. You can keep these in your living room, bedroom or even your kitchen. They will do their part of tying the room together can uplift the mood. Yellow and golden rugs are also a perfect addition to your hallways as runners. Yellow or a golden rug would blend well with reds, greens, and other woody tones. They would also be a perfect match for wood floorings. The look of a yellow rug is enhanced if you are keeping it in a room designed in white. A yellow rug with beige walls and a splash of white makes a perfect setting for a royal dining experience or a perfect living room abode. When we say yellow rug we are not just talking about the plain yellow shades but how about a bright yellow floral pattern on a blue or a green background? I am sure you are getting excited, so go ahead and browse through our rugs by colour section. We understand that the colour of the rug is important and when we say colour then we are talking of numerous shades of a single colour which in their individual sense create a different mood. Hence we try to incorporate all the shades which might be available in yellow or different trendy combinations of golden which surely make your guests ask you, “Where did you purchase this rug from?” Get one today and don’t worry about the price, it is the best which you will find anywhere else online.